Based on the classic clue game of I Spy. 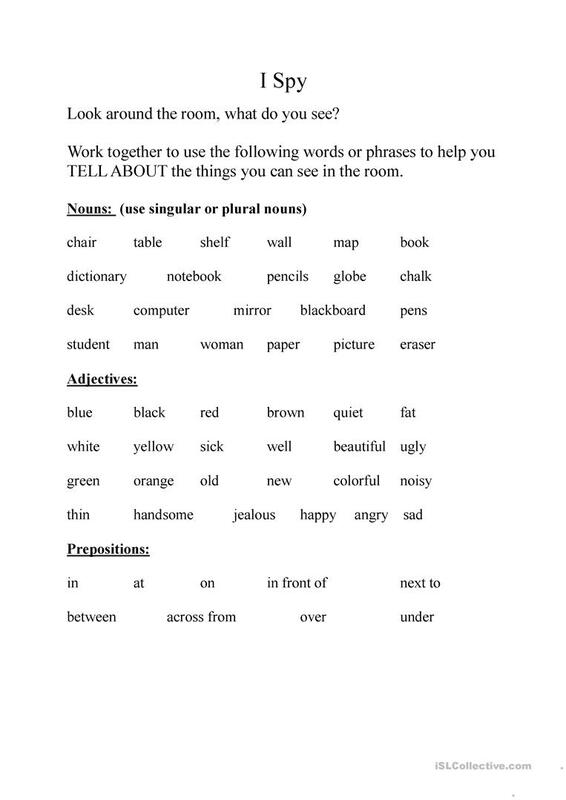 Use classroom objects with adjectives and prepositions to give each other clues as to what you are looking at. Students must listen to descriptions, remember information, and make educated guesses. This downloadable teaching material is best suited for adults at Beginner (pre-A1), Elementary (A1) and Pre-intermediate (A2) level. It is valuable for practising Adjectives in English, and can be used for developing your pupils' Listening and Speaking skills. It is about the theme of Words easily confused. Cathie4esl is from/lives in United States and has been a member of iSLCollective since 2012-07-17 14:24:33. Cathie4esl last logged in on 2018-01-10 20:38:06, and has shared 1 resources on iSLCollective so far.